Our next gathering of The Nora Salon is Friday, September 21! We hope you’ll join us for a glass of wine, friendly conversation, and an informal reading of an excerpt from Kacie and Karen Devaney’s two-act play: The Great Forgotten. In 1917, Elizabeth is one of the first registered nurses to offer her services in France when the United States finally enters World War I. Her sister Celia, an artist at heart, never shies away from adventure, so she signs up as a volunteer to aide in the Great War, tagging along with Elizabeth for what she imagines will be an exciting experience. 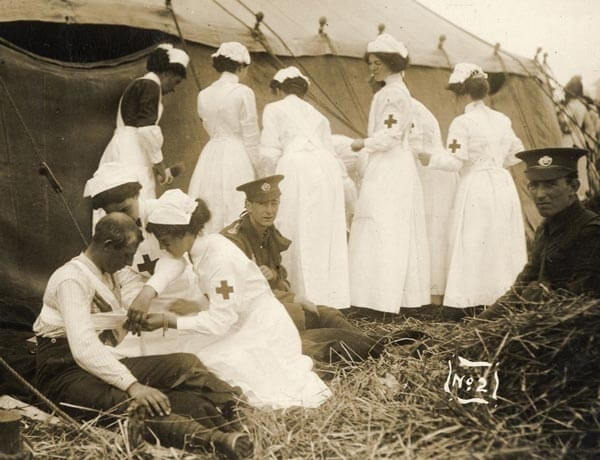 Together with their fellow nurses, the sisters are faced with the gruesome realities of trench warfare as they struggle to save the thousands of wounded soldiers who pass through base hospital 21. Through friendship, tears, and laughter, these unsung heroes perform extraordinary acts of courage, even when it means risking their own lives. With the World War I centennial just around the corner on November 11th, we hope you will join us for the premiere reading of this new, completely revised version of The Great Forgotten by mother-daughter playwrighting team Kacie and Karen Devaney. Please email us at reservations@norasplayhouse.org to add your name to the guest list. You’ll receive the apartment number and directions in a separate email when your reservation is confirmed.